A flower bed can be a beautiful addition to your commercial property! Are you a commercial business owner or tenant? Are you trying to improve the appearance of the exterior of your building? Many businesses make the mistake of neglecting to landscape their property. In addition to general grounds maintenance such as raking leaves, lawn mowing, tree/shrub pruning, mulching, etc., a beautiful flower bed could take your landscape to the next level. Here is what you should know about flower beds for your commercial business! If you are going to construct a flower bed for the outside of your commercial facility on your own, you need to do your research ahead of time. Many factors need to be taken into consideration when one is putting together a flower bed. You need to consider the climate, daily amount of sunlight, the types and color of flowers, when and how long flowers bloom, watering frequencies, etc. If you are unsure of anything, consult JFK Lawn and Landscape. 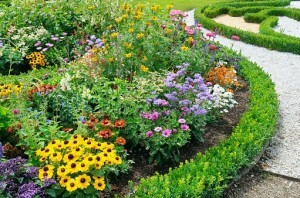 Our experts have years of experience constructing and caring for flower beds. Give us a call today! After your flower bed is constructed, you can’t just forget about it. Your new flowers need your attention if you want them to remain to look beautiful. To begin, it is a good idea to get onto a watering schedule. Water is life, and its importance shouldn’t be understated for your flowers. You also want to consider fertilizers for your flower bed. If used correctly, fertilizer can provide your flowers the nutrients they need to thrive! Finally, you, of course, need to weed and prune your flower bed and swap out any dead flowers when the time comes. Unless you are an expert gardener or have years of experience caring for flowers, you may want to consult or bring in a professional to help you with your commercial flower bed. This is because your flower bed could be the icing on the cake for your commercial landscape. Be sure to have different colors and types of flowers to complement the seasonal changes. If done correctly, your flower bed should catch people’s eyes and be a focal point to your business’s property all year round. This entry was posted on Friday, September 1st, 2017 at 4:05 pm. Both comments and pings are currently closed.